Orangeville Chorus. She began in 1979 when the chorus was first being formed and proudly directed 40 brand new Sweet Adelines at the charter celebrations in 1981. Pat has always had a passion for the barbershop sound - her dad was a barbershopper - so it is in her genes! Over the years, she attended innumerable educational events to increase her knowledge and improve her directing skills. Pat achieved Certified Director in 1993. Over her 35-year history as Director of Orangeville Chorus, Pat led an ever-changing group of women (only three charter members remain in the chorus – Pat being one of them), in many different circumstances. From the back of a hay wagon on the main street; in the freezing cold under the Christmas tree at Town Hall; in nursing homes and hospitals and many community events; to cabarets, and many shows and performances; culminating in the large-scale production ‘Feel The Beat!’ at The Rose Theatre in Brampton in 2009. At every performance she directed, she was prepared, engaged with her singers, and smiling at the audience as she demonstrated her skills and sheer joy of being a Sweet Adeline director. 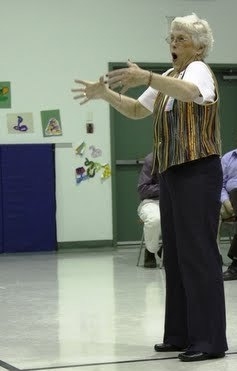 Pat was on the regional contest stage as a director 30 times. Under her direction, the Orangeville Chorus won several small chorus awards, Most-Improved Chorus three times, and First Place AA in 2008 and 2011. In 2009, with then co-director Joan Borden, the chorus was awarded Most-Improved for the fourth time, 2nd Place AA, and 4th-place medalists overall. By achieving 605 points in this contest, Pat Vipond was granted the title “Master Director” – a lifetime designation – and something her chorus has known she was all along! By achieving first place AA in the 2011 regional contest, with a score of 615 points, the Orangeville Chorus earned an invitation to compete in the Harmony Classic at the Sweet Adelines International convention in Denver, Colorado in October 2012. The Chorus placed 4th at this, their first appearance on the international stage! A proud moment in Pat's directing career! Pat retired as Director of the Orangeville Chorus in May of 2014. She continues to sing on the risers, while also supporting and mentoring Joan Borden, in whose directorial hands she has left the chorus. With all that talent, Pat has also tried her hand at arranging over the years, and Orangeville Chorus has performed some of those arrangements. Pat sings baritone in the quartet, It Takes Thyme, along with her daughter Cathy Koolen (lead), chorus Director Joan Borden (bass), and Elly Brass (tenor). They competed in the regional quartet competition in 2009 and 2010. The quartet provides education in four-part harmony to elementary school students as part of the ‘Music in the Schools’ programme. Pat served on the Regional Management Team as the Directors' Coordinator for six years, sharing her knowledge, experience and love of the Sweet Adeline craft. 10 grandchildren, and one great-grandchild! She is a retired Air Canada employee, thus she and Gary have taken many wonderful trips together to far-reaching places. Pat has many musical interests, including involvement in the Orangeville Concert Association, the Dufferin Arts Council, and an ongoing interest in the Elmer Iseler Singers. Her favourite performer of all time is Willy Nelson! The CD player in Pat’s kitchen is never turned to ‘off’ unless she is outside enjoying her second-favourite hobby – gardening.